Mumbai as the city and Maharashtra as a state are leading other cities and states in India, and perhaps the world, in terms of traffic accidents on rail network and roads. In the case of suburban trains, sheer pressure of crowd is a major cause of deaths as it often leads to people falling off the trains or coming under them while crossing the rail tracks. Road accidents take place more as a natural byproduct of increasing volume of heterogeneous traffic consisting of trucks, buses, taxis, autos, cars – big and small ? 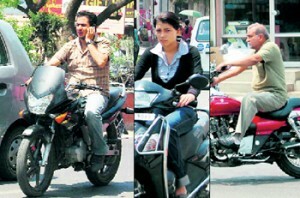 as well as two wheelers (all with different speeds and styles), and deterioration in compliance with the rules by all the users of the road. In high volume heterogeneous traffic, strict observation of rules and self imposed discipline are very important as a slight oversight for a fraction of a second can cause an accident. The data with traffic police shows that during the last year, there were 539 road accidents involving deaths of 563 persons ? mostly pedestrians. The number of serious accidents was 1905, and that of non serious accidents, 2767. The total number of road accidents show some decrease over the previous year. However, a number of accidents go unreported which, despite being technically small, are in quite a large number. Blaming the traffic police for this large number is not right because the responsibility for such a huge number of accidents rests primarily with the drivers and to some extent, even with the pedestrians. One part of the solution is to provide the accident victims rapid access to trauma care in the first hour after the accident. With the universal access to a mobile telephone, it is relatively easy to establish a system that enables to provide the required information for shifting of victims to the nearest hospital in time. But the staff at the hospital needs to be sympathetic, pro active and efficient while the facilities must be very good. It is also important that we develop and maintain a universal system for interactive access through mobile telephony with trauma care providers, right from the moment of reporting of the accident to the patient receiving the required care without any avoidable loss of time. The other and more i mportant part of accident management is the prevention. This is possible only through (primarily) good driving and walking behaviour as well as meticulous observance of rules with zero tolerance of deviations. Unfortunately, this does not happen. 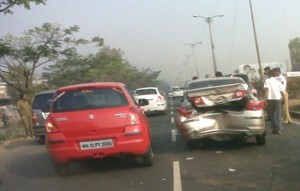 Accidents are rather high during peak hour traffic which offers very less scope for driving fast or carelessly. That best explains the scant regard we pay to rules. Not following traffic lights during the early hours of the morning and also when the traffic is relatively thin is common and best explains the behavioural trend. Hence, the solution to reducing accidents has to be strict enforcement of discipline and rule compliance. For this, we need to effect radical improvement in signages, especially on the roads. Bright lane marking and junction box marking is simply absent on our roads. Properly designed and brightly painted & lit pedestrian crossing is often missing. 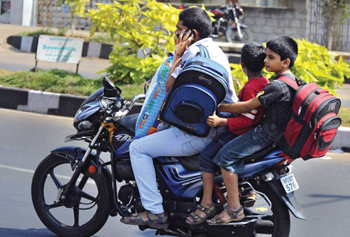 It is clearly not possible to expect the traffic police to catch the discipline violators who drive through yellow and red signals or overtake in wrong manner (violating the lane discipline as well as speed limits) or the motorcyclists who indulge in weaving in traffic or jaywalkers who walk on the carriageway even when the condition of the footpath is good (which is not very common though!) 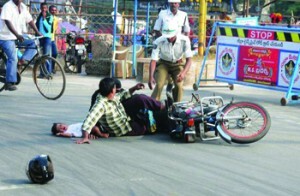 The incidence of bad driving amongst the bus & truck drivers and motor cyclists is also alarming. The only way to control such behaviour, unfortunately, is a high level of deterrence. This can be achieved with the use of electronics on one hand and by building a perfect end-to-end system for compliance on the other. The latter should be done in such a manner that the driver of any vehicle would fear the costly consequences ? both in terms of high fines and, also in terms of action with a very poor chance of getting away ? should he indulge in rule violation. This latter part will make a radical difference to driving (even walking behaviour) in crowded cities with high volume of heterogeneous traffic like Mumbai. What steps are needed for this? The level of fines which has been static for the last several decades must be i ncreased. For all traffic offences, it needs to be at least three to four times the current level ? just to keep pace with the overall inflation during the last 30 years if not for any other reason. Secondly, a repeat offence within a period of six months should increase the level of fines. A system for driver vehicle points was worked out a few years back by Mumbai Transformation Support Unit but it seems to have been completely ignored. Under this system (prevalent in many well managed countries) a driver gets a number of negative points for each type of offence. As the violations increase or diversify, the number of points gets added and at a certain point of time, the license gets cancelled and beyond that, the vehicle is liable for confiscation. This is besides the fines. It is good to increase the amount of fine but it should be possible to ensure that there is a fairly high probability that a person committing a breach of traffic rules is apprehended and made to pay the fine. He has to believe that the fines can?t be escaped. Further, if he doesn?t pay the fine in time, the amount of fine increases making it impossible to avoid or postpone the payment of fine. A person will think twice before repeating an offence if he realises that the repeat offence will entail progressively higher punishment — leading to higher fine, losing license and even confiscation of cars. This realisation will change the entire attitude towards careless & unsafe driving and even walking at key junctions where footpaths and zebra crossings are available. Earlier, Mumbai was considered a city where drivers observed the traffic rules. But now that reputation has completely vanished. It is getting worse every day. Fortunately, IT offers economical, practical and effective solutions for high volume traffic with precision. It requires the setting up of a complex system using exhaustive and up-to-date database of all vehicles and their drivers with correct and latest addresses, email id, mobile telephone number, insurance policy details of the vehicle and the driving licence details of the drivers who normally use a particular vehicle. It is also important that our laws be updated so that the basic responsibility of the offence rests with the owner of a vehicle even though he may hire the services of a driver or lend the vehicle to his family members or others. This kind of amendment and awareness thereof will prevent parents from allowing their young children to drive their cars recklessly. The database mentioned above must be continuously updated with new purchases, scrapping of the old vehicles or sales of second hand vehicles. It should also incorporate mobile telephone numbers of the owners and details of the driving licences of persons authorised to use /drive the car and the number, type and validity period of the insurance. This database must be accessible to traffic police. The second element of the system is the installation of CCTV systems at major traffic junctions and some road stretches. The CCTV will read the RFID to be fixed at the front glass of each vehicle, storing all the required data from the dbase as mentioned above. Any vehicle violating lane discipline, not stopping at pedestrian crossing, overtaking in a wrong manner or over speeding will be captured with the help of RFID by the CCTV system and this information will be relayed to the central server storing the dbase in real-time. The server will send an sms alert as well as detailed challan on the email id giving complete information on the nature of offence, the amount of fine and procedure to credit the amount in a bank with the bank details. On receipt of the payment in the dedicated account, an email receipt will be issued. The non-compliance details will be added to the vehicle dbase. Credit of fine will be appropriately stored. In case of the offender not responding to the email advice (to be repeated twice), a physical challan (with significantly higher cost) must be delivered to deter the violator from ignoring the electronic challans. It is necessary to insist that the owner of a vehicle accepts the responsibility of providing accurate data and installs the RFID on his vehicle. This should not be considered as an avoidable exercise. In fact, this is a very mild step if we consider the problem of increasing car ownership leading to heavy congestion. For reaping the benefits of positive results such an exercise will lead to, this is a small price to pay. It is the basic social responsibility of the owners of cars, taxis, buses, trucks, autos and two wheelers. A vehicle costs much more than a computer or a mobile phone. And a car owner in the modern cities in India ? which prides itself as IT superpower and the most advanced country in the usage of mobile phones ? must accept to be electronically literate to receive and read SMSs and accept the responsibility for his/her driving behaviour. Such a system can virtually apprehend every violator and the enforcement agencies can reach the violator within minutes. It can have a lot of secondary benefits including the solving of hit and run cases by simply capturing the vehicle number. It can also track the thefts of cars as well as improve security by tracking the suspicious vehicles without clumsy nakabandis! In the beginning, an awareness campaign will have to be launched under which information on the working of IT based compliance system will be explained to all the vehicle owners. Owners will have to be informed that they will be responsible for their cars/vehicles ? irrespective of who drives them (unless the vehicle is stolen) and in case of violation of discipline, it is the owners who will be apprehended. Similarly, dummy sms and email notices can be run to check the efficacy of the system and educate people about the same. This will collect real-time data in a comprehensive manner. In the beginning, there will be some accidental and some deliberate cheating which should not derail the system by instilling baseless fears in the minds of people and regulators and creating imaginary & legal obstacles. This is a positive and profitable way to bring about a method in the traffic atmosphere of the country and will usher a virtuous cycle of using IT for governance. Some manual checks and audits are needed in the first few months. Extra physical efforts will be needed to be put in to trace the addresses of the offenders quickly, serve a challan and be ready with fast track courts so that the users will realise that the government is serious about enforcing the system. People will soon follow the system. Once they realise they cannot run away, they will become more disciplined which will automatically reduce the accidents.